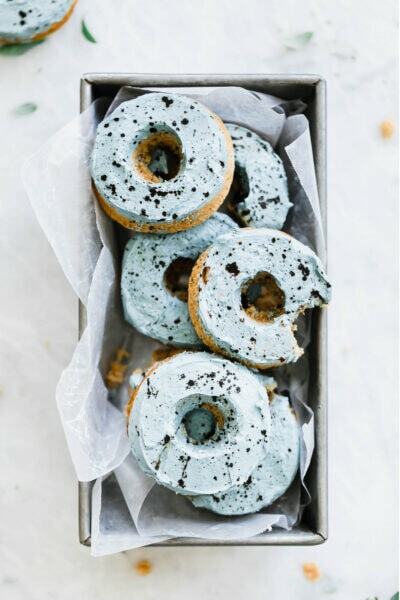 Hello and welcome to the very first in a series of monthly travel posts on Broma Bakery! 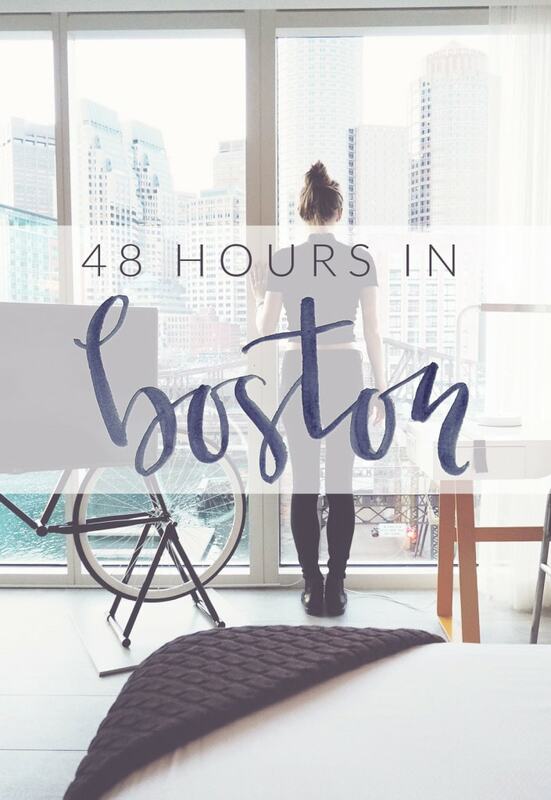 I have been planning for months and am so excited to share my first 48 Hour Guide with you all. If food is my first love, then travel was my first kiss. Ever since the tender age of 13, I have had a strong travel bug. I love experiencing new cultures, new geographies, and new food. When people asked me what I wanted to be when I grew up, I would eagerly state “a National Geographic Photographer,” because it perfectly combined my love of photography and culture. My love for travel and adventure spurred me to be an anthropology major in college, where I learned about different ways of life around the world (…and also about chimpanzees. but that’s another story). But after college, my professional life came first and travel was put (mostly) on hold. 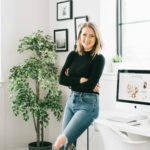 Now that I’m in a career with flexibility, I’m reigniting my love of travel with a monthly series of 48 Hour Guides focused on food and drink in various cities throughout the USA. 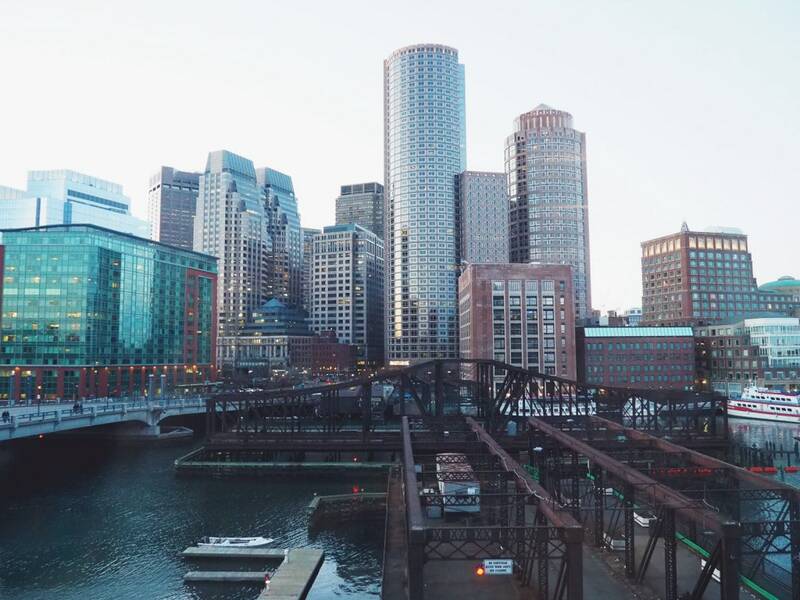 Of course being a native Bostonian, I had to start the year off with a guide to Boston. So without further adoo, Welcome to Beantown! Marriot recently came out with a new line of independently managed hotels, called the Autograph Collection. Each hotel is iconic and unique, in a style I believe to be for a younger generation. No more beige carpets and poorly lit rooms. Instead, Autograph Collection hotels are beautifully decorated, with a balance of modern luxury and classic elegance. The Envoy Hotel is one such member of the Autograph Collection. I was absolutely floored by the attention to detail, unique touches, and commitment to quality. The staff was so friendly and willing to go out of their way to make our stay comfortable. They even brought us up a charcuterie platter before dinner to tide us over. And let’s talk rooms for a minute. I don’t think I’ve ever stayed in a better room. 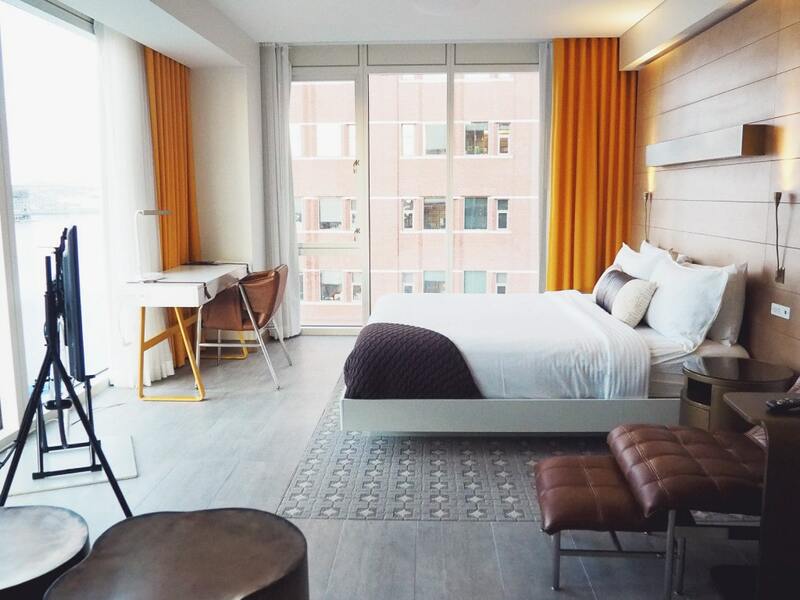 Floor to ceiling windows, light and bright design features; it felt like our room was an extension of the city, from old maps of the seaport etched into the bathroom walls to pops of yellow complementing the blue of the ocean below. Plus, with the Envoy you can enjoy all the benefits of a Marriott hotel, so if you stay in different Autograph Collection hotels across the country you can rack up Marriott rewards. Just saying. 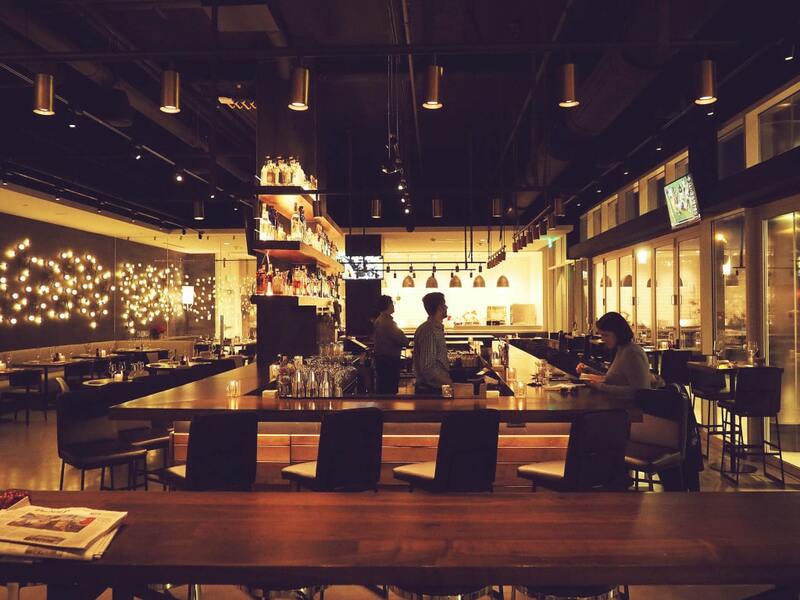 Outlook Kitchen and Bar is located on the ground floor of the Envoy. At night it’s warm and inviting, with a killer liquor selection and a four-sided bar. It’s the perfect place to stop in for a nightcap, or to eat dinner without leaving the comfort of the hotel. 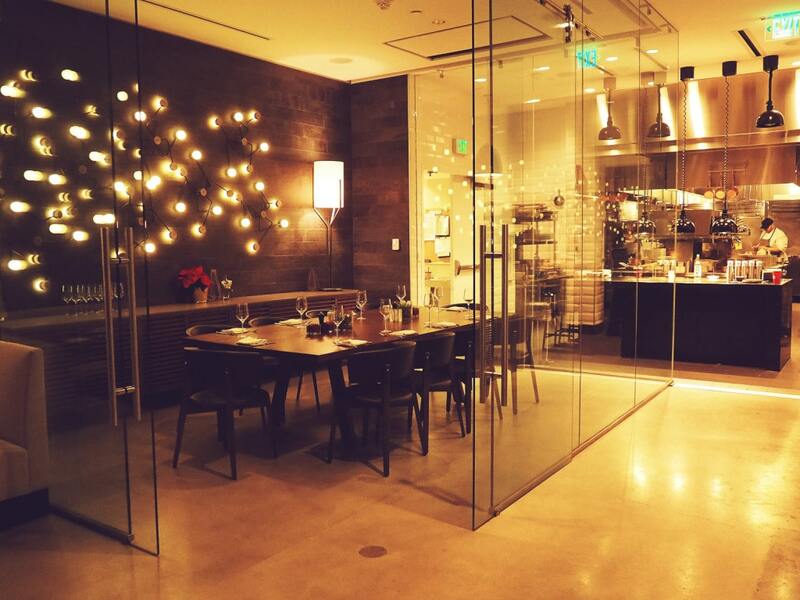 They also have an amazing private dining room. The glass enclosure provides separation without fully removing you from the hustle and bustle of the dining room. And you get an open view into the kitchen, almost like your own private show. Sofra is without a doubt my favorite eatery in Boston. Am I biased because I used to work there? Possibly. But do they serve the best breakfast I’ve ever had? Most definitely. 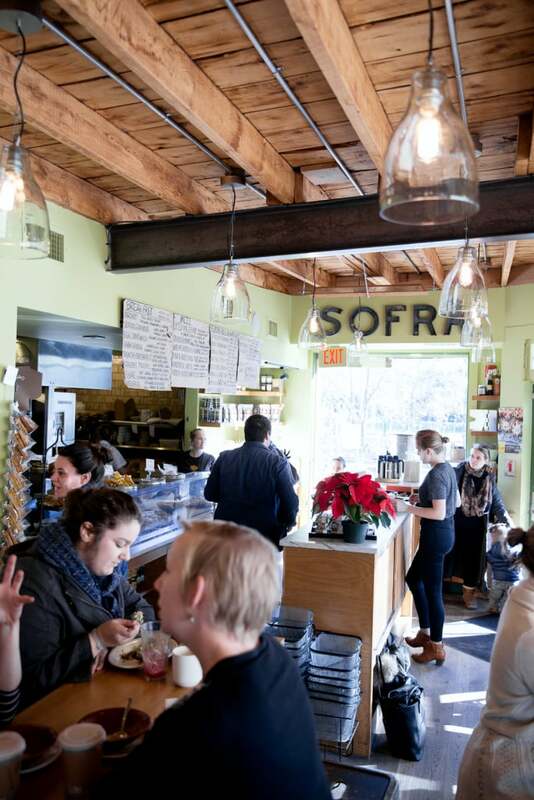 Located in the northwest corner of Cambridge, Sofra calls itself a “bakery & cafe,” but it is so much more. 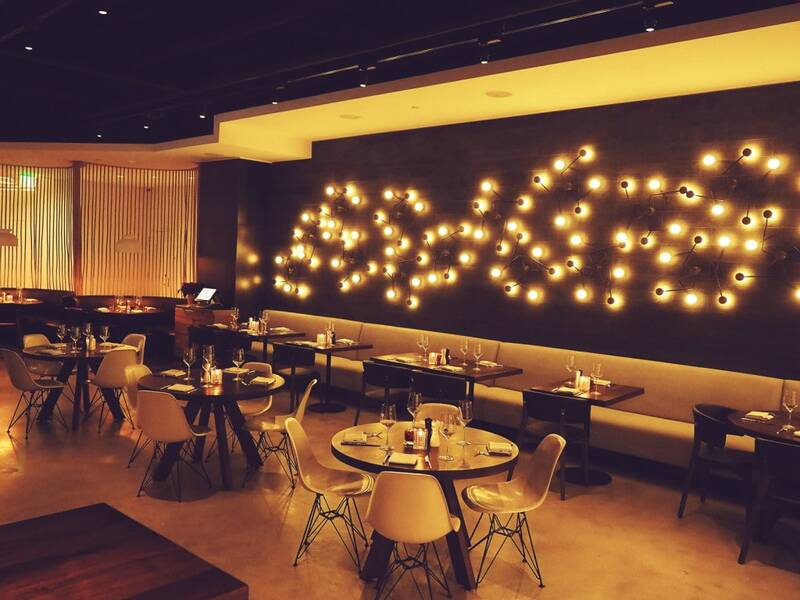 Sofra’s food combines Turkish/Middle-Eastern flavors with fresh and exciting presentations. 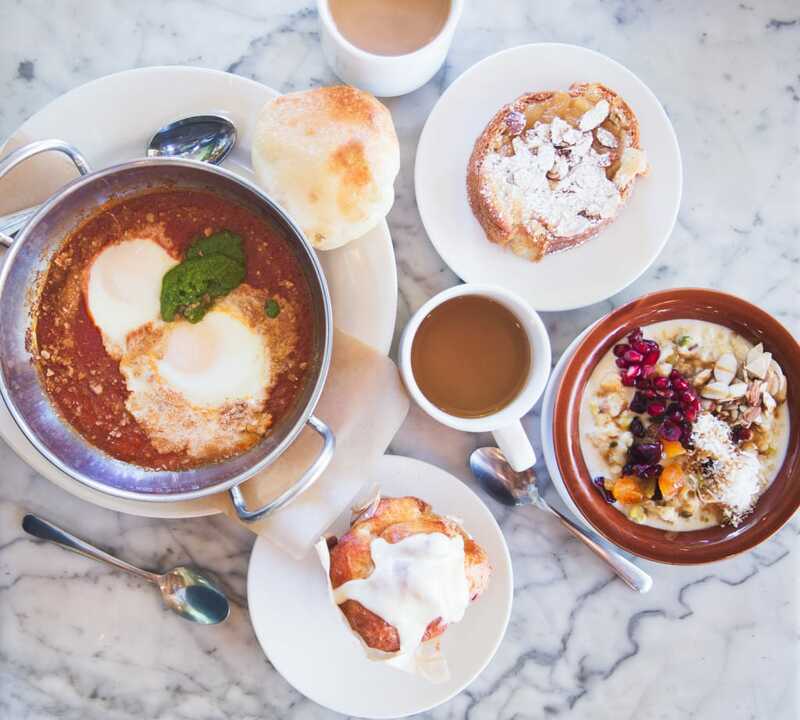 Things like shakshuka (which I just recreated here), morning buns (croissant dough rolled in cardamom sugar and topped with orange blossom glaze), and asure (whole grain hot cereal with pistachio, almond, and rose). 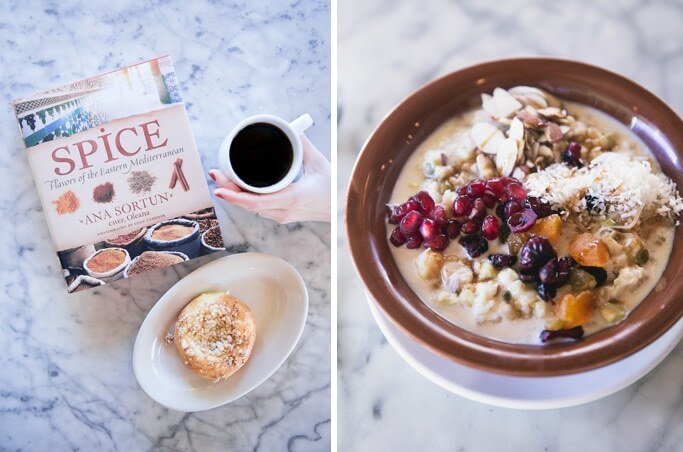 Sofra serves breakfast, lunch, and dinner 7 days a week. They have a fantastic selection of beverages like tahini hot chocolate, orange apricot iced tea, and turkish coffee. And there is a large to-go fridge filled with things like red pepper whipped feta, carrot kibbeh, and muhammara. It’s honestly the most interesting and flavorful place I have ever been to. Every time I go is a treat, with every dish full of amazing and exotic flavors. This restaurant is the sole reason Turkish food is my favorite cuisine. I’m totally serious. Guys, do not miss this place. 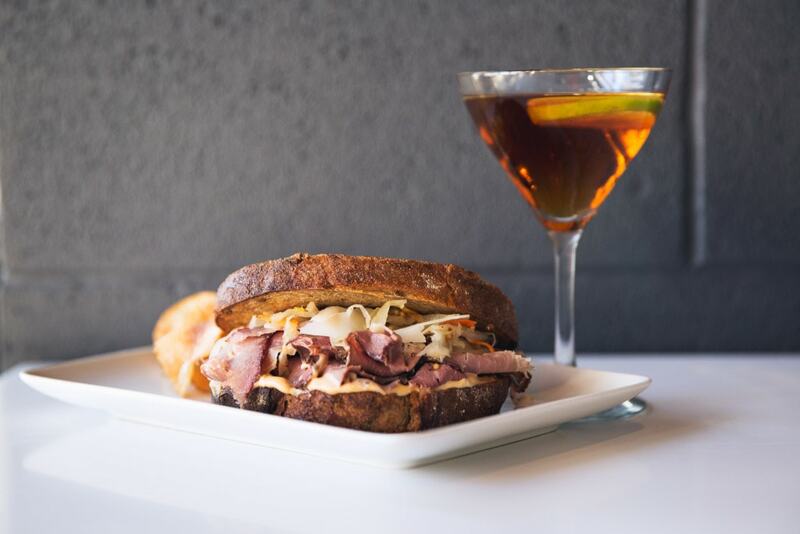 Ames Street Deli is a short drive away from Sofra. 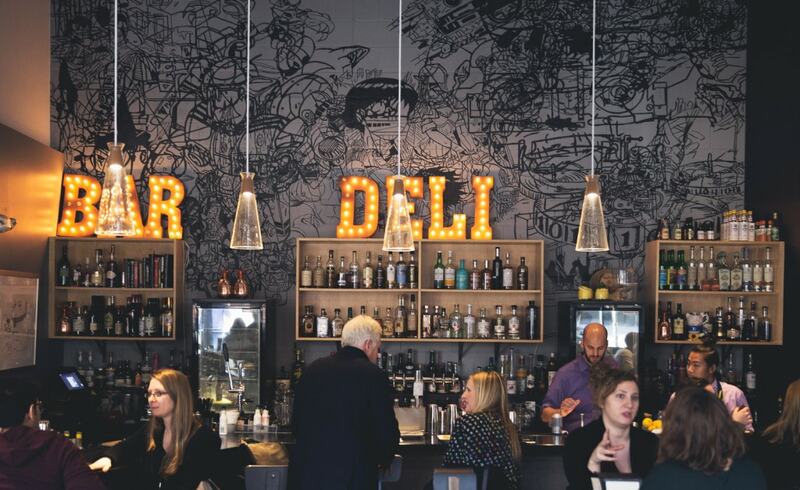 One of the coolest things about it is the way they combine a deli and a bar. During the day time, the shop is filled with MIT students, professors, and working professionals. 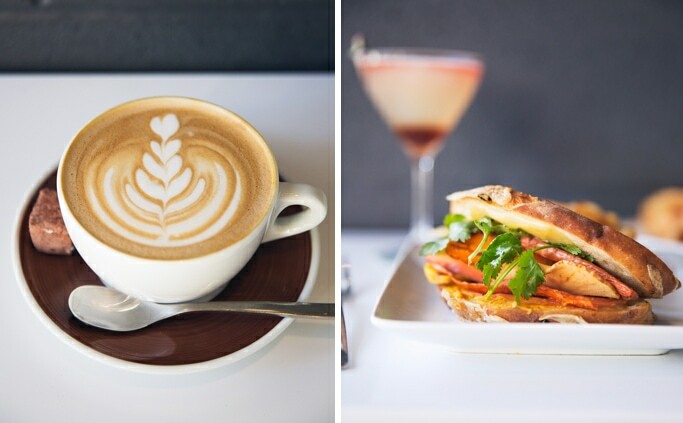 They serve a variety of sandwiches and baked goods equally suitable for a sit down meal or for lunch on the go. At night the space is transformed into a craft cocktail bar with delicious noms to match. Of course, if you want a cocktail with your lunch that’s always welcomed. We got the Pastrami Sandwich and the Carrot Sandwich, with a healthy dose of cocktails. Also noteworthy was the side of bok choy and squash. Mmm bok choy. Of course no lunch is complete without a latte. And they made a mean one. Barcelona Wine Bar and I have had a long-standing love affair. It’s the perfect spot to unwind while still feeling part of the action, great for date night or group dinners. Their patio in the summer is lively and airy, while the dining room in the winter feels cozy and homey. I’ve been to their Brookline location over a handful of times in the last year alone. 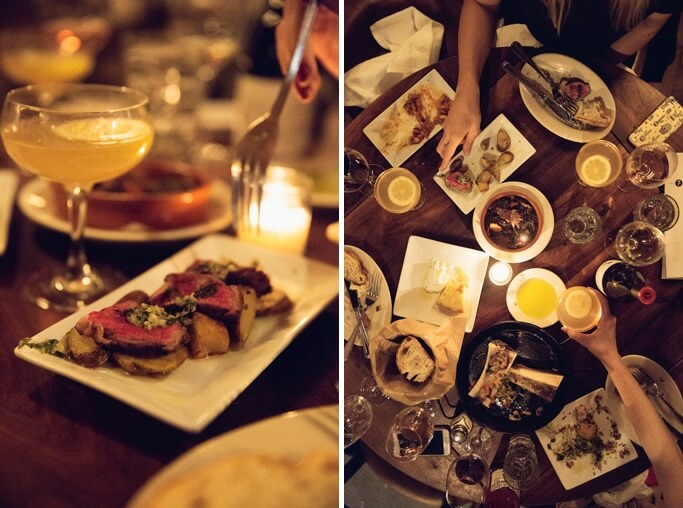 Maybe it’s my love for Spanish tapas, or maybe it’s my obsession with stylish restaurant decor. Or the extensive wine selection. Or all three. Whenever I go to Barcelona Wine Bar, I’m treated like family. The staff is friendly and makes the menu approachable no matter your taste preferences. The 200+ seat restaurant is always full, a testament to its popularity. And the menu changes not only seasonally but sometimes as much as daily, depending on the supply of their ingredients. Though there are multiple Barcelona Wine Bars throughout the North East, each location’s chef is encouraged to put their own spin on things, creating a truly unique dining experience. 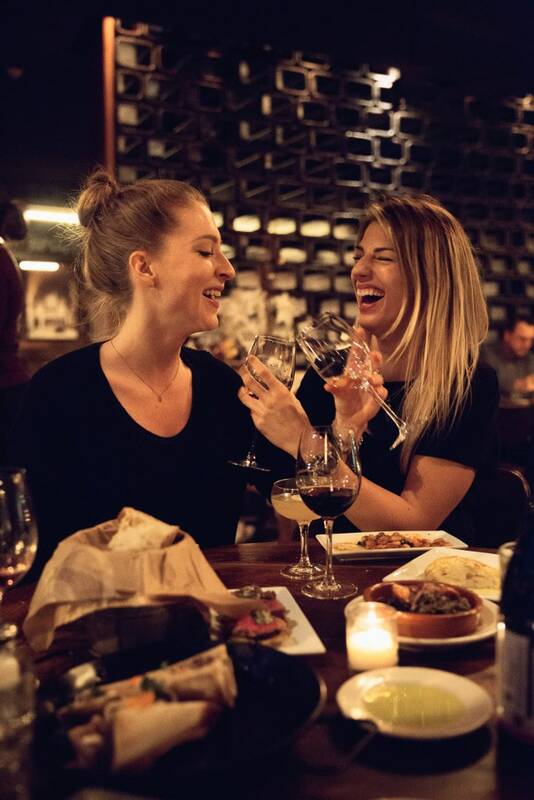 Of course there are some classics like their truffle, Mahon, and jamon Serrano grilled cheese bites or their rotating selection of Fideos (sort of like a paella, but with noodles). Their wine flights are a fantastic pairing to a meal full of tapas, with three different half glasses grouped by region. Or go for a round of cocktails! 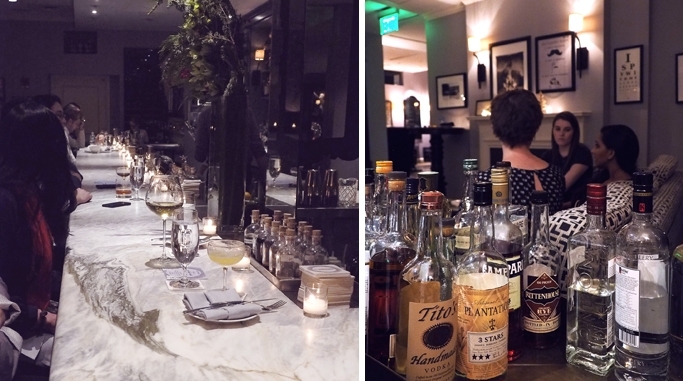 If you’re still standing by the time you leave Barcelona Wine Bar, head over to The Hawthorne for a nightcap. 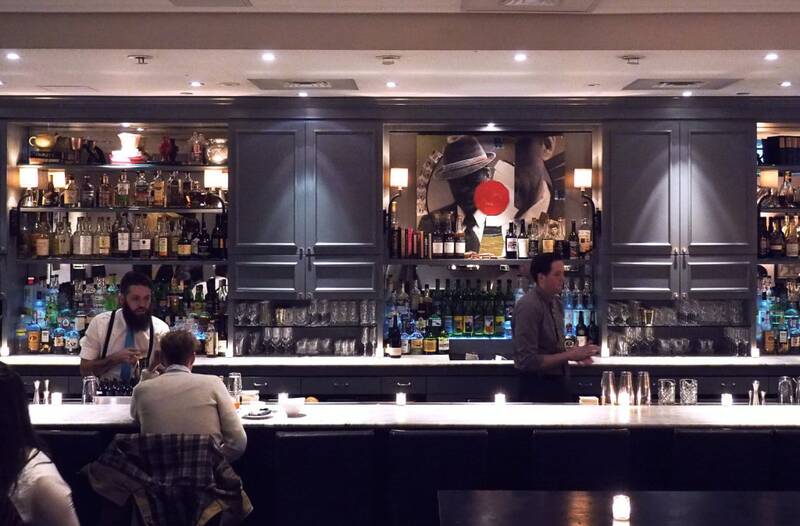 Its elegant decor and muted blues and grays make for a perfect moody drinks spot. 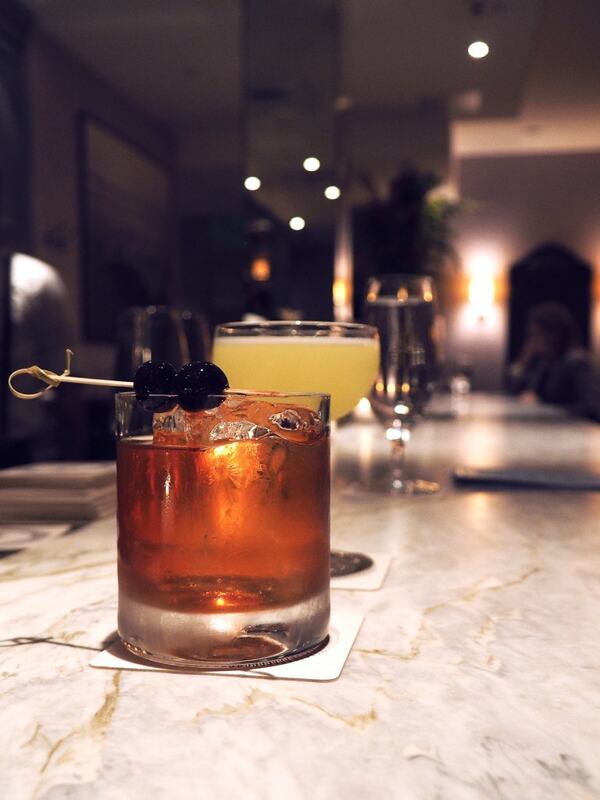 The Hawthorne is known for its strong cocktail selection, made by bartenders who turn Old Fashioneds into art forms. The marble bar top makes for a perfect display of each carefully crafted drink. 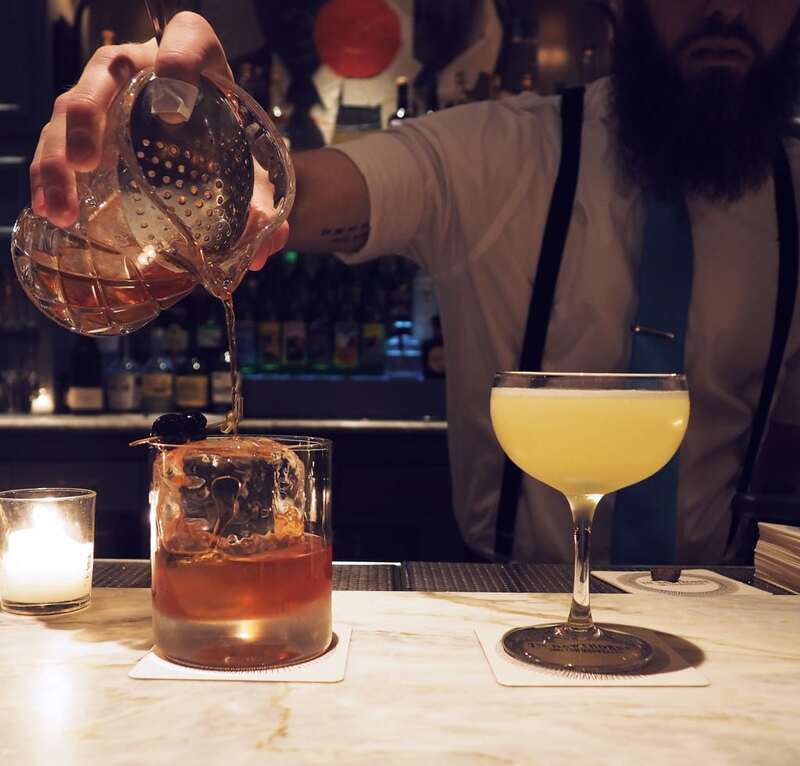 In addition to classic concoctions, The Hawthorne has a carefully curated collection of whiskeys, cognacs, mezcal, and rum. So your boyfriend/husband/mezcal enthusiast friend will be crazy excited by the selection. They also have a separate room where they hold functions, pop-up shops, and private events. I happened to go one night they were hosting a pop-up event with local artists from the Boston area. I love when local businesses work with each other, especially when booze is involved. It was the perfect place to relax on plush couches while sipping a spiked apple cider. OMG, what fabulous timing!! Our son is at Northeastern and it graduating in May (yay!) and I was just thinking that we needed to book a room. 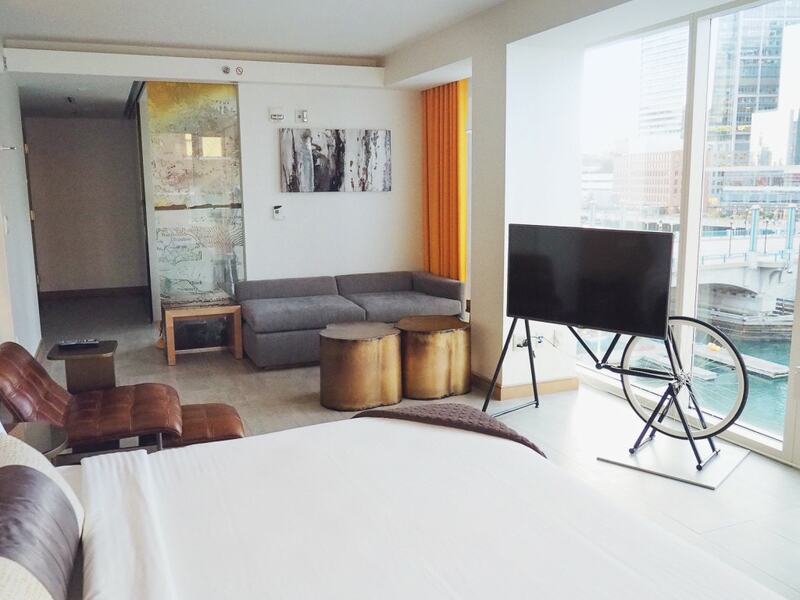 The Envoy looks lovely and we just reserved a room for 2 nights! Thanks so much for the recommendation and can’t wait for Thursday’s post!! Oh you have no idea how much I’m SO glad to hear that, Maureen! You are going to love it. Thank you for following along and thank you for your support!!! Love this!!! You should do one for NYC some time :). I’m planning on it! This spring 🙂 Thank you Isabela! Oh YAY!!! That’s wonderful. Don’t hesitate to email me with questions! I remember when Sofra opened. It was such a tiny place and super busy whenever I stopped in. I used to work in Cambridge and would take consultants there for lunch. My only negative is that it really is not in Boston…actually it is closer to the Watertown border of Cambridge which is pretty far afield from downtown Boston and the Seaport district where the Envoy is located. I’m so glad you know Sofra! In Part 2 I talk about how you should get a car to explore, because Cambridge is such an integral part of Boston. So I totally understand!